My Creative View: Sketch it Out! When I use a sketch, it has to fit me and the way I scrap. I don't work the other way around. I love the work that Ashley does and am very excited about her sketches. Thank you for being generous and sharing your ideas. This is my LO for her Sketch it Out challenge at Club CK. I kept the original design, but I used larger photos. I was very excited to try matting everything on black CS. I've seen this around a lot lately and LOVE the crispness and clarity it brings to the LO. For these photos, I thought using the black would highlight the red shirt instead of the green grass and blue jeans my son is wearing. The long banners were perfect for a sports LO. Because the photos and banners are larger, I used smaller embellishments, and made the title smaller as well. 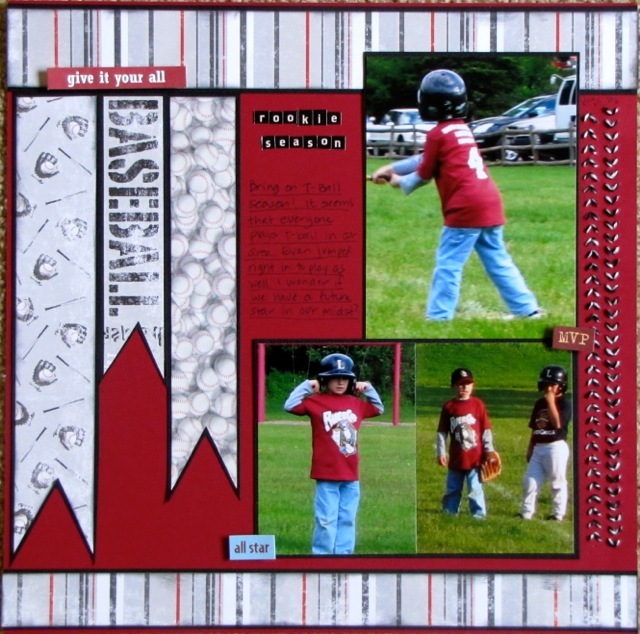 I chose to sew with twine along the right side of the photos, creating my own chevron, that mimics the stitches on a baseball. CS-Bazzill, PP-Moxie, Paper Pizazz, letter stickers-Cosmo Cricket, word embellies-The Paper Loft, Twine-Doodlebug.